Invest Hong Kong (InvestHK) has announced that Hong Kong will play host to the first Hong Kong Fintech Week in early November, part of a new drive to position the city as the premier centre in Asia for Fintech companies and start-ups looking to grow their business as well as for accelerators, incubators and investors searching for Fintech innovation. At a launch event held this evening, attended by more than 400 guests including the Secretary for Financial Services and the Treasury, Professor K C Chan, as guest of honour, InvestHK announced the programme for Hong Kong Fintech Week. Supported by partners from the private and public sectors, Fintech Week will take place at PMQ in Central from November 7 to 11. Fintech Week will turn the spotlight on the latest trends in Fintech development, including exciting pitching sessions, demos, workshops and networking events. 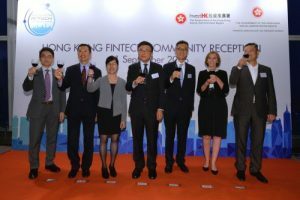 With support from partners in the Fintech ecosystem such as Cyberport, Hong Kong Applied Science and Technology Research Institute, Hong Kong Science and Technology Parks Corporation and other players across the region, Fintech Week will provide a perfect demonstration of how global Fintech trends meet Hong Kong’s unique advantages. InvestHK announced the establishment of its dedicated Fintech team. The team will assist overseas and Mainland start-ups, investors and R&D institutions in establishing a presence and expanding in the city, and will organise international events to promote Hong Kong’s Fintech ecology. Moreover, a new Hong Kong Fintech campaign logo, website (www.hongkong-fintech.hk) and branding were unveiled at the launch event, signifying the vast opportunities for Fintech development provided by Hong Kong’s extensive nexus for growth. He added that with the setting up of a dedicated Fintech team, the Government is continuing its efforts as announced in the 2016-17 Budget to provide a wide array of support for the city’s Fintech innovators, enabling them to focus on formulating solutions to enhance operational efficiency for financial institutions as well as improving client experience for customers and investors in managing their finances, thereby promoting Hong Kong as a hub for Fintech. “Hong Kong welcomes Fintech startups and SMEs. The quality and depth of Hong Kong’s infrastructure is reflected by the fact that it is a base for almost 8,000 multinational corporations and three-quarters of the world’s top 100 banks, along with a multitude of insurers, asset managers and other financial services companies. It is both a business centre and a launch pad for companies with ambition to cover the Asian market,” said Mr Francis Ho, the Acting Director-General of Investment Promotion.